The final day of the Telugu Titans' home leg played host to a high-voltage clash as the home team cruised to a 41-36 win over the defending champions Patna Pirates at the Rajiv Gandhi Indoor Stadium in Vishakapatnam. Faced with a Do-or-Die challenge coming into their final home game, the Titans appeared like a pack of hungry lions as they raced away to a 6-0 within the first few minutes and inflicted an all-out on the visitors in the sixth minute. Rahul Chaudhari's fine run of form camouflaged his poor outings in the last two games as the 'poster boy' combined with Nilesh Salunke and got the better of the Patna defenders to finish with eight and seven points respectively. Leading 26-15 at the break, the Titans only needed to hold on to the lead and ensure that the Pirates did not stitch a comeback. The hosts picked up a couple of bonus points but were then hit hard by a burst of confidence from Pardeep Narwal as the Patna skipper picked up a host of points before struggling through the tackle from Vishal Bhardwaj to inflict the all-out on the Titans. However, it was all in vain as the day belonged to the Titans and in particular, Rahul Chaudhari, who finished with 13 points and in the process also became only the second man after Pardeep Narwal to breach the 800-raid point landmark in the league. Patna's only bright spark came through Pardeep, who finished with 12 points while the honors belonged to Rahul Chaudhari. The ace raider, in the post-match conference, detailed his strategy in the game. "We had to play this match as a Do-or-Die game for us. In the beginning, I was not successful in the Do or Die raid situations but the coach asked me to continue and go about my natural game. That gave me confidence which translated to results on the mat"
Titans' coach Sai Prasad, thrilled at the way the whole game had panned out right from the start showered praise on his star raider but mentioned that the focus was to excel in both departments. "I knew that once Rahul got going, no one could stop him. The strategy was not concentrated on just raiding or defending but on both fronts," as he added, "The message to the team before the match was to take every raid as a Do-or-Die raid which brought about very good coordination in the team which helped us win the game." Titans' skipper Vishal Bhardwaj, who was one of the main architects of the big win with four vital tackle points in the game echoed the coach's thoughts and credited the entire team for the much-needed win. "Even before stepping on to the mat, we knew that we had to win the match at any cost. The raiders were given the freedom to go for the kill and the defense unit took in the confidence from the raiders which portrayed as a combined performance on the mat." 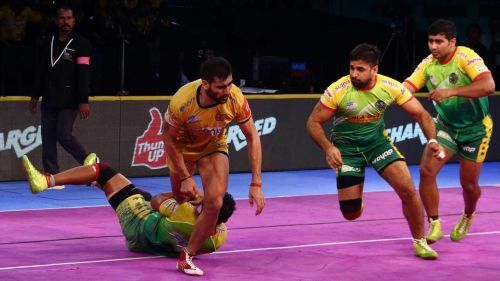 For the Pirates, it certainly was an off-day and the performance was summarised by Patna Pirates' coach Ram Mehar Singh as he said, "The main mistake was in the defense. We also had a few problems with the raiding at the start," as he continued "If the defense had a little control, we could have gained the advantage. The right corner and cover position defenders were a little too keen to tackle and that lost us a lot of points." While the vociferous crowd at the Rajiv Gandhi Indoor Stadium certainly did not favor the visitors, the fact that the Pirates were facing a possibility of a hat-trick of losses against the Titans in this season only added pressure on the defending champions. Yet, coach Singh played it down to errors and not any sort of pressure and said, "I cannot label as pressure but the performance seemed like it was an issue from the defensive unit." In the end, the Pirates coach smiled as he was quizzed on the path ahead for the Patna Pirates as he laid out the need of the hour for the Pirates. "We have four matches from which we need to win three for sure. If we win three, we can qualify for the playoffs and then take it from there."